In June of 1972, a woman appeared in Cedar Senai hospital in nothing but a white gown covered in blood. Now this in itself should not be too surprising as people often have accidents nearby and come to the nearest hospital for medical attention. But there were two things that caused people who saw her to vomit and flee in terror. The first, being that she wasn’t exactly human. she resembled something close to a mannequin, but had the dexterity and fluidity of a normal human being. Her face was as flawless as a mannequin’s, devoid of eyebrows and smeared in make-up. From the moment she stepped through the entrance to when she was taken to a hospital room and cleaned up before being prepped for sedation, she was completely calm, expressionless and motionless. The doctors had thought it best to restrain her until the authorities could arrive and she did not protest. They were unable to get any kind of response from her and most staff members felt too uncomfortable to look directly at her for more than a few seconds. But the second member of the staff tried to sedate her, she fought back with extreme force. Two members of staff holding her down as her body rose up on the bed with that same, blank expression. What in the hell are you? There was a long pause, the security had been alerted and could be heard coming down the hallway. She stood up and leaned over him, her face coming dangerously close to his. As he went into shock with fear, she calmly walked away. 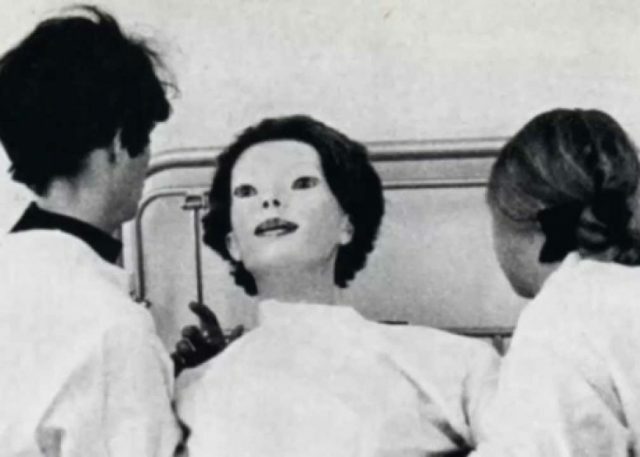 The female doctor named the woman ‘The Expressionless’. There was never a sighting of her again.